In Roo Island, gummy dice are a popular dessert. That is, before the gummy dice attacked! The main goal in Attack of the Gummy Dice is to destroy the gummy dice. Your aim is to have as few gummy dice as possible on the screen. To do this, you are given a set of blocks (in a particular shape) to drop somewhere on the 3-D field. To clear dice from the screen, you must drop them into groups of five or more like-colored dice, and they will be removed. You will get points based on the number of dice in the group; the more you manage to group together, the higher the bonus you will be awarded. Essentially it is like 3-D Destruct-O-Match, but you add blocks to the screen instead of destroying groups of them. Additionally, from level two onwards, a random colored block will be added to the playing field after every move you make. You need to clear a certain number of blocks on each level in order to progress. But note that if a stack reaches eight blocks, it's game over! Yum? Yes, while we're not invading! Bomb Die This destroys all dice directly below it. Morph Die This turns all dice directly below it the same color. Rock Die This cannot be destroyed, unless you use a bomb die or morph die (see above). Think of this as the indestructible block in Destruct-o-Match. ;) NB: you can't destroy them by putting five together. Color Changing Die This die will change colors until you drop it. If you time it right, this can be a very useful block. It will only appear once you reach level 3. Always place bomb dice above the tallest stacks of dice to score higher. Likewise, always place morph dice above the tallest stacks of dice, and any additional dice in the set above another die with the same color. This allows you to get a set of dice easily. Try to place rock dice closely together on one part of the screen. This makes it easy to remove when you get a Bomb or Morph die. 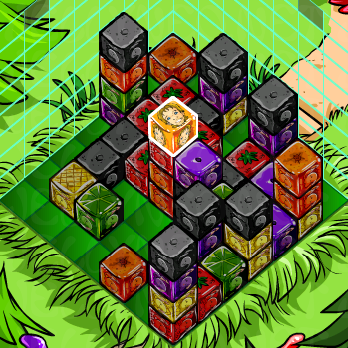 While the game is not timed per se, extra blocks will start appearing after level 9 if you do not place your blocks quickly. 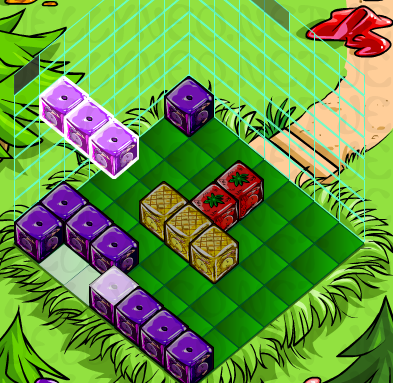 These extra blocks, if left unattended for a while, will eventually end your game. Scoring is very simple: number of blocks cleared - number of blocks left on the board at the end of the level = points for the level. You will get bonus points if you cause a chain reaction. That is to say, if you destroy one group of blocks, causing other blocks to fall so that another group is destroyed, the second group will be double the points. Type delightful to turn the current set of dice into morph dice. This can only be used once per game. Type explode to turn the current set of dice into bomb dice. This can only be used once per game. Type gummydice to change the current set of dice into a random different color. Very rarely, you may get a block with the face of Oliver on it. This block destroys all blocks in columns surrounding the block. Also, you can find Oliver by clicking the Blumaroo's eyeball when you send your score.